Stunning colour double drop faceted pear-shape Siberian Pink Sapphire earrings suspended on rhodium-plated 925 sterling silver box chains with 925 sterling silver ear wires. As every computer monitor colour & resolution is different, the best way to describe the colour of these Pink Sapphires is as violet-pink (as opposed to red- or blue-pink). This is a real Pink Sapphire which is lab-grown. Genuine Pink Sapphire crystals are collected and then grown in controlled conditions in a laboratory. This process produces completely flawless and pure pink Sapphire crystals. Metaphysically, these stones are said to be powerful carriers of the Pink Flame, which is governed by Archangel Chamuel. Archangel Chamuel is Master of the 3th Ray, or Pink Flame, and is known as the Archangel of Love. The keywords associated with this ray are Love, Forgiveness, Mercy, Adoration, Compassion, Gratitude, Soulmates and Life Purpose. In the realms of the 3rd Ray, alongside Archangel Chamuel we find Paul the Venetian, Ascended Master of the ray of love. He represents and, therefore, resonates with beauty, the perfection of the soul through compassion, patience, understanding and self-discipline. If these are the energies you feel most drawn to, then the light of the Pink Ray is the one to work with. 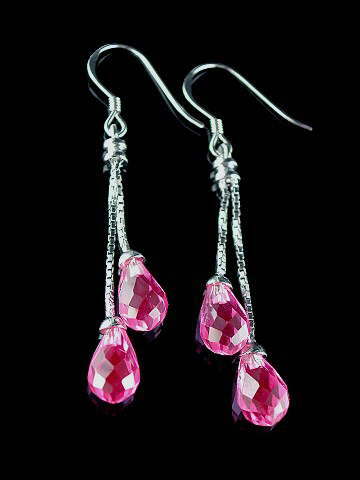 Pink Sapphires are also said to provide strength in trying or difficult situations. They are a stone of passion and joy; uplifting the wearer. They bring into balance the elements of water and fire; promoting balanced emotional strength and clarity of mind. ‘Siberian’ in gemology terms, is often applied to gemstones of a flawless nature and of the and highest AAA grade, as with this one.